Small towns are plenty all over this country. They possess a certain charm and grace that large cities just don't come close to duplicating. New England has some of the most beautiful small towns I have ever been to. Being one who loves the small stream I have crossed through some quaint picturesque places and I could not begin to list there names and the qualities they bring forth. I was asked once how do you know when your in a small town, what is key to what defines a small town. My answer is this. When in New England you know when your in a small town when there isn't a Dunkin' Donuts shop. Without a doubt New England is known for it's barns, and beautiful fall foliage. One of these day I'm going to wander through one of those barns. 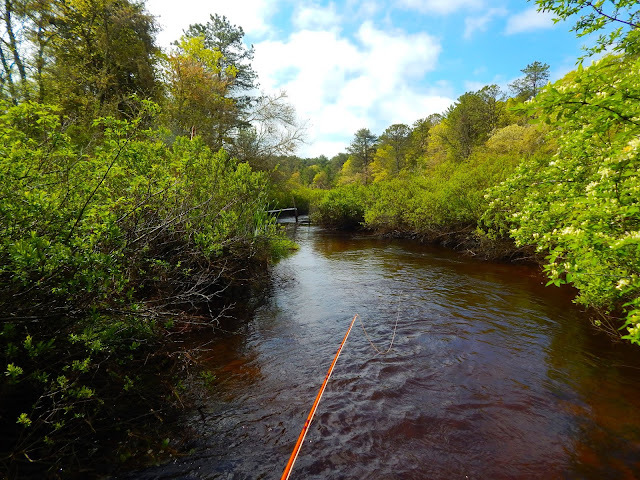 Where else could you fly fish for wild brook trout in salt water? Then a few miles away from the stream find your self getting dizzy trying to negotiate a traffic rotary. How about catching a brook trout on a salmon fly...not many areas of this country can lay claim to that. Bill you will enjoy the time spent in New England especially in the fall. Those quaint little towns have some wonderful little shops to visit. The Driftless area is a lot like rural New England. I love both areas. David I will visit the Driftless area one day. What! No Dunkin Donuts?? Just kidding. I don't believe I've ever been in one. Small towns with the Fall Foliage is just gorgeous. Mark Dunkin' is tops. I don't know if they have shops on the west coast. A beautiful time of year to be driving through NE small towns. Beautiful photos, Alan. A lot of beautiful little towns still remain in New England that is for sure. 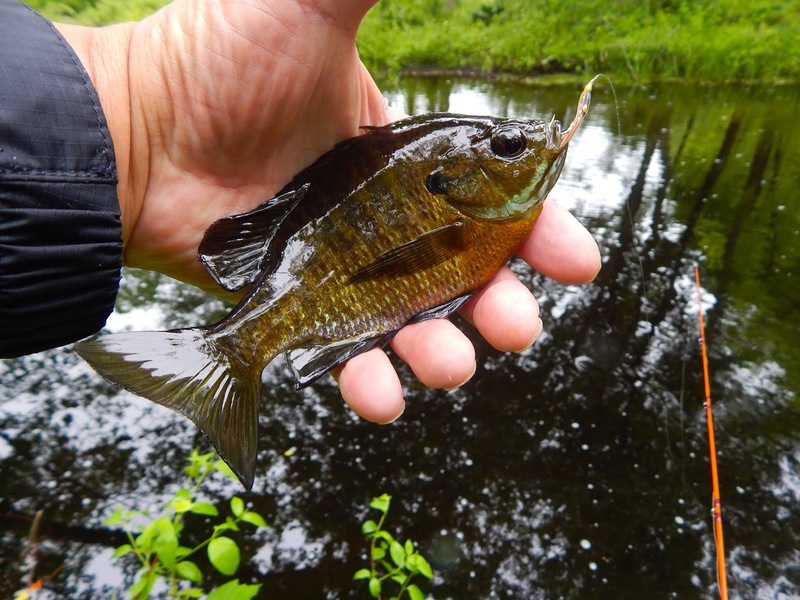 Seeing the picture of that blue gill harkens me back a couple of years ago when I was fishing to a riser along side the opposite bank from me on the Swift. I made a decent cast and had a good drift and the fish took. 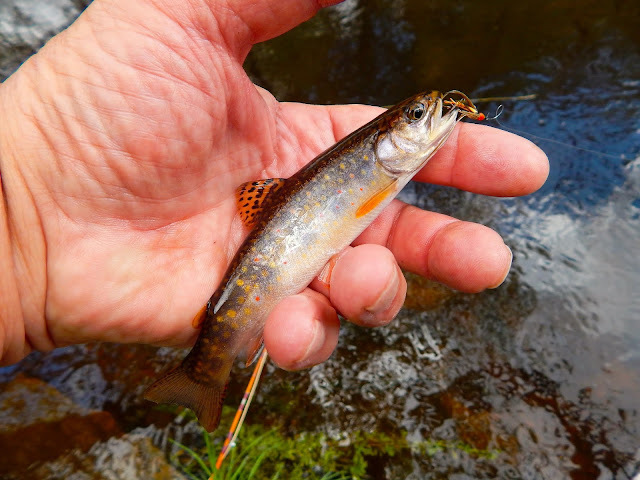 Not big, I thought it was a brook trout but it turned out to be a nice sized blue gill which put on a good fight. I haven't caught a blue gill there before or since. I have a feeling the big trout dine on them when they get the opportunity. Sam it would take us years to visit the little towns of NE. Those bluegills can battle especially on light gear. I guess bigger trout will eat the smaller gills. I know bass do. John one of our most pleasant drives took us through the Amish countryside in Lancaster. As far as a New England state it would be hard for me to select one or two or six. They are all beautiful and have so much to offer. The town in the first photo is Stark N.H. it is my favorite. It is in many respects the America I recall growing up. Lot's of history there. my kind of post, I love small towns and the surrounding areas, cant be doing with all the hustle & bustle of cities. Lovely post Alan. George things seem to slow down in those small towns. A change we could all benefit from. I was born and raised in small town New England. At one point, like many people, I left to see the world. When I got back I set up my chair on the porch and determined to never leave again. My little New England town boasts a population of 350 souls. Mike you got the nonsense out of your life and settled into a more enjoyable life. Your town is quite the small one. Haven't been able to stretch my legs in New England in a while, but I really think I need to change that this year. While we've got plenty of Dunkin Donuts where I'm at, there's no salter brook trout or the charm of barns and colorful fall leaves. There's just something about New England (and the Canadian Maritimes for that matter) that is uniquely special. Mike DD is in Florida. Salters are quite the fish to put in your journal. They are New England icon. They are also quite prevalent in the Maritimes. Having grown up in a small town on the edge of the North York Moors I can fully appreciate your fondness for them. Like Mike I left my home town to go to the city for studies and work returning some 15 years later. Unfortunately my home town has expanded almost out of all recognition now! Fortunately where I live now is just a few minutes drive from the moors National Park with it's peace, solitude and (of course) trout streams. Alistair seems like many of us have the desire to return to those kinder, gentler times of our small town heritage. The small town is alive still and it's great to be able to return. A National Park, I guess your safe from development. Not where I live Alan, it is one of the largest private housing estates in Europe! However, the boundaries of the town are minutes from the National Park - I can see the moors and hills from my house! Yes indeed Brk Trt we are indeed so very fortunate to be living in New England..
Mike you'll get no argument from me on that statement.